What Are Malas ?--The word "mala" is the sanskrit word for necklace or a flower garland. Malas are for your mantra meditation, or to wear as a sacred necklace or stacked bracelet. Handmade By Artisans--We support our Artisans by ensuring they work under certified humane conditions, are paid a fair wage and produce based on their cultural traditions and natural resources. Sustainable Material--We provide environmental, social and economic benefits while protecting the environment upon first extraction of our raw materials until final disposal. One-of-a-kind Style Jewelry--All natural gemstones beads have their own unique markings and colors, so the Mala you receive will be an original True Nature Jewelry design. 1.ABOUT MALA: Mala beads have been used by yogis and spiritual seekers for thousands of years to help keep their minds focused during meditation. It is a tool to help you count mantras, and acts as a tactile guide as you sit in silence. 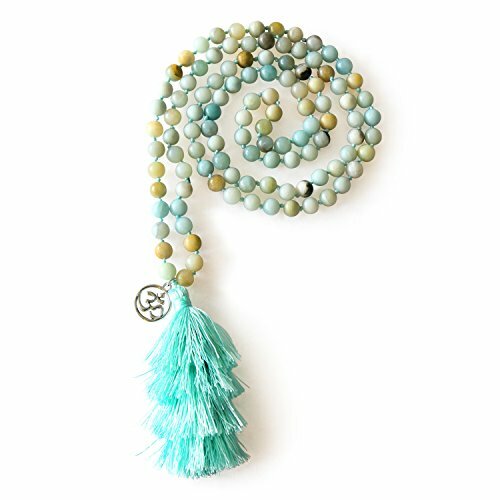 2.MATERIAL: Made with 108 8mm Amazonite Beads, silver OM charm, finished with a layered silk tassel. Each mala bead will be unique and may vary in color and size because malas are made of authentic gemstones. 3.SIZE: Length for 108 Mala Beads:21〞/54cm; Size for Bead:8mm; Length for Tassel:8.5cm. Wear it as a necklace or wrap it around wrist loosely as a bracelet. One size fits all. 5.Comes in an eco-friendly burlap bag for easy gifting. The perfect present for any female in your life - Mum, Aunt, Sister, friend - whoever. If you have any questions about this product by MHZ JEWELS, contact us by completing and submitting the form below. If you are looking for a specif part number, please include it with your message.